This Sunday the Chargers will be bringing a couple of former Bills players with them on their coaching staff. Pete Metzelaars is San Diego’s tight ends coach and Frank Reich is their offensive coordinator. It’s Reich’s first year in that role after serving as quarterbacks coach last year under new Chargers head coach Mike McCoy. McCoy explained why he promoted Reich after former OC Ken Whisenhunt left for the Tennessee head coaching post. The high profile breakfast will be held from 9-11 am and Reich will present the 2013 Call to Courage Award to Indianapolis Colts All Pro Center Jeff Saturday. He was named to six Pro Bowls and named First Team All Pro twice in 2005 and 2007. 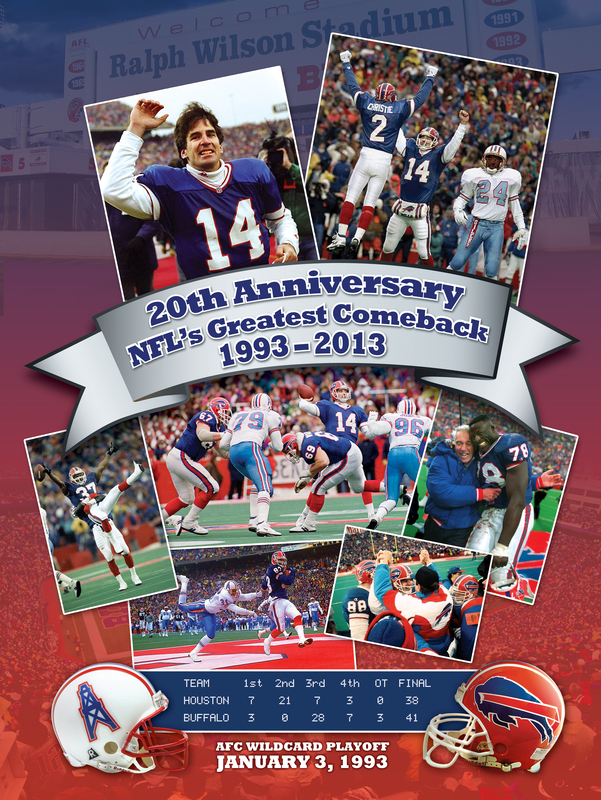 A special highlight of the program will be the 20th Anniversary celebration of the “Greatest Comeback in NFL History”. Joining Reich for a look back video highlight panel discussion will be former Buffalo Bills greats Andre Reed, Kenneth Davis and Steve Tasker. Buffalobills.com will cover the event. The honorary chairman for this year’s breakfast will be Buffalo Bills kicker Rian Lindell. In addition to the NFL winner of the Call to Courage Award, the High School Call to Courage Award will also be given to an outstanding member of a Western New York high school football team. Buffalo Bills play –by-play man, John Murphy is this year’s MC. A commemorative Limited Edition 20th Anniversary – Greatest Comeback poster will also be made available, exclusively for those in attendance at the breakfast. The Call to Courage Award Breakfast is open to the public. Tickets are $40 each and a table of ten is $350. For ticket information call 716-559-1800 or find them on Facebook at aiabuffalo. He knows the NFL, after 14-years as a player, and five as an assistant coach. And Frank Reich knows the Buffalo Bills, after spending 10-years as a backup quarterback with the team. The architect of the greatest comeback in NFL history says both of the men the Bills have interviewed for their head coaching vacancy in Arizona this week would make good head coaches for the team. Appearing on The John Murphy Show Thursday night, Reich said former Arizona Head Coach Ken Whisenhunt would make a great Head Coach in Buffalo. Reich spent last year as the wide receivers coach for the Arizona Cardinals. He was dismissed by the Cardinals Monday, along with Whisenhunt and the rest of Arizona’s offensive staff. But he says if Whisenhunt winds up as the Head Coach in Buffalo, he’d like to tag along. “Obviously, I think I have a good relationship with ‘Whis,’ and I would be knocking on his door if he got the job, saying, ‘bring me along with you, I would love to go back to Buffalo.,” Reich told John Murphy. Reich also had positive words for Arizona’s current Defensive Coordinator Ray Horton, who interviewed for the Bills Head Coaching vacancy earlier this week. Reich is watching the Buffalo situation closely, as he gets ready for his next job as an assistant coach in the NFL. After ten succesful years as Jim Kelly’s backup with the Bills, he’s already thinking about possibly coming back to the franchise. The John Murphy Show airs weeknights from 7-9pm on the flagship station of the Bills, WGR Sports Radio 550. Call to Courage event next Sat. The 11th Annual Call to Courage Awards Breakfast will be held a week from today on Sat., March 24, at the Hyatt Regency Hotel in downtown Buffalo, NY, from 9-11 am. Every spring for the past ten years, former Buffalo Bills quarterback, Frank Reich, who engineered the “Greatest Comeback in NFL History”, hosts the community sports breakfast event, which is sponsored by the Buffalo Pro Ministry of Athletes in Action. Reich will present the 2012 Call to Courage Award to Cleveland Browns Tight End and former Super Bowl Champion while with the New England Patriots, Ben Watson. Also scheduled to be in attendance are Bills Wall of Famer Steve Tasker and Bills QB/WR Brad Smith. Special speaker at this year’s event will be former Ohio State Head Football Coach Jim Tressel, who is currently the Vice President for Student Engagement for the University of Akron. All three nominees have met the criteria of not only being a great student athlete, but also exemplify outstanding character, commitment and leadership on and off the field. They are leaders academically in the classroom, in their home and in the community and honor God in everything they do and have answered the Call to Courage. The Call to Courage Awards Breakfast is open to the public. Tickets are $40 each and a table of ten is $350. For ticket information call 716-559-1800 or find us on FACEBOOK at aiabuffalo. Former Bills QB Frank Reich has landed a new NFL coaching job with the Arizona Cardinals. Reich was named wide receivers coach for Arizona and goes to the Cardinals after spending the past six seasons with Indianapolis, including last season as the Colts wide receiver coach. He began his coaching career with the Colts as an intern in 2006-07 before serving as an offensive staff assistant in 2008 and then as quarterbacks coach from 2009-10. Reich had coached alongside Bills new tight ends coach and his former Bills teammate Pete Metzelaars in Indy the last five seasons. Former Bills players Frank Reich and Pete Metzelaars, who were both members of the Colts’ coaching staff under Jim Caldwell are the latest to be relieved of their duties with the club. That according to the Indianapolis Star. Metzelaars has been the team’s offensive line coach the past two seasons while Reich was most recently the team’s receivers coach after previously serving as QBs coach. Metzelaars had been on the staff the past eight seasons, while Reich had been with the club for four. Bills FS Jairus Byrd will present the Call to Courage award to a WNY high school football player at the 9th Annual Athletes In Action Call to Courage Award Breakfast, which will be held on Sat. April 17. Also to be honored is Super Bowl champion FB Heath Evans for his community efforts in helping children and families affected by sexual abuse through his Heath Evans Foundation. Frank Reich will preside over the festivities, which begin at 9 am in the Hyatt Regency Hotel in downtown Buffalo. The Western New York Athletes In Action Call to Courage Award breakfast is the second largest breakfast event of its kind next to the Athletes In Action Super Bowl Breakfast featuring the presentation of the Bart Starr Award, which is held every year in the host city for the Super Bowl the Saturday morning before the Sunday Super Bowl. Tickets are $40 each and a table of ten is $350. For more information call 716-559-1800 or go online. Frank Reich’s Athletes in Action Call to Courage Breakfast will be honoring some of Western New York’s best collegiate and high school talent at the Hyatt Regency in downtown Buffalo this Saturday. Reich will present the collegiate version of the Call to Courage Award to University at Buffalo defensive linemen, Andrae Smith. The 6’4” 257 lb senior from Bloomfield, CT, is being recognized for his leadership on the field, on the campus and in the community. Andrae has outstanding character and was selected for this award by UB Head Coach, Turner Gill. Five finalists have been selected for the Western New York High School Call To Courage Leadership Award. Frank Reich will announce the actual winner and present the award at the breakfast. Tickets are $40 each and a table of ten is $350. For more information call 716-559-1800 or visit their website at www.aiabuffalo.com. Colts offensive assistant and former Bills QB Frank Reich was promoted to quarterbacks coach by new Colts head man Jim Caldwell. Caldwell had been the team’s quarterbacks coach under Tony Dungy, who announced his retirement earlier this week.